In Hawaiian, the plumeria is called, “melia.” These soft, abundantly fragrant flowers have become a hallmark of Hawaii. 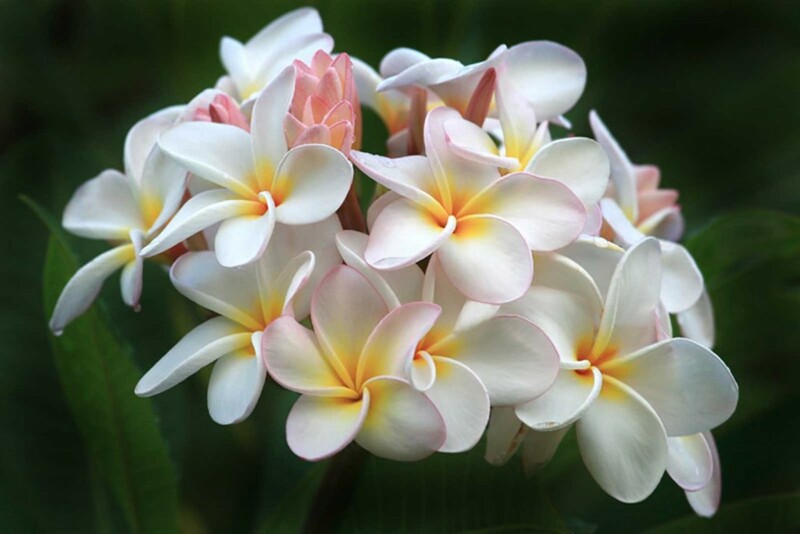 Sitting in tight, beautiful bunches atop small trees, plumeria beckon to be seen, smelled, and plucked from their branches to enjoy throughout the day. Originally from Central and South America and related to the Oleander, several species of plumeria have made a home in Hawaii. You can find them throughout Hawaii from yards to airports and resorts to hillsides. Today they are used in flower leis, ornamental landscaping, and during special ceremonies like weddings. Wandering in from Canada, I have made my way to New Jersey, through New Hampshire, Kansas, and now High Desert Country. My passion is photography. I have been through many Canons, briefly lost my mind with an Oly E-620, and had to return to the Canon fold :) Started off with an XTi, added a 50D and now I have my favorite 7D! Got a 100mm 2.8L macro, a 100-400L and am in heaven LOL Along with photography, IR cameras, my passions are genealogy, creating websites, and sweepstaking, as in: www.angelsweepstakes.com.